Thanks to generous donations from students and friends of Param Yoga, Lisbeth is able to continue her work on the mosaic project. Thank you! It’s been so hot recently that work on the project was suspended for a couple of weeks, but Lisbeth got back to work this week and, unbelievably, was able to make the birdbath even more beautiful than it had been. 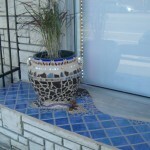 She covered the base with cobalt blue tile pieces in all different shapes and sizes. Most of them look to me like guitar picks. She ringed these with two rows of clear green stones and a single row of clear lavender stones that look almost black against the dark grouting. Then she surrounded the entire thing with iridescent cream-colored tiles that shimmer with hints of green, blue, lavender, and pink. 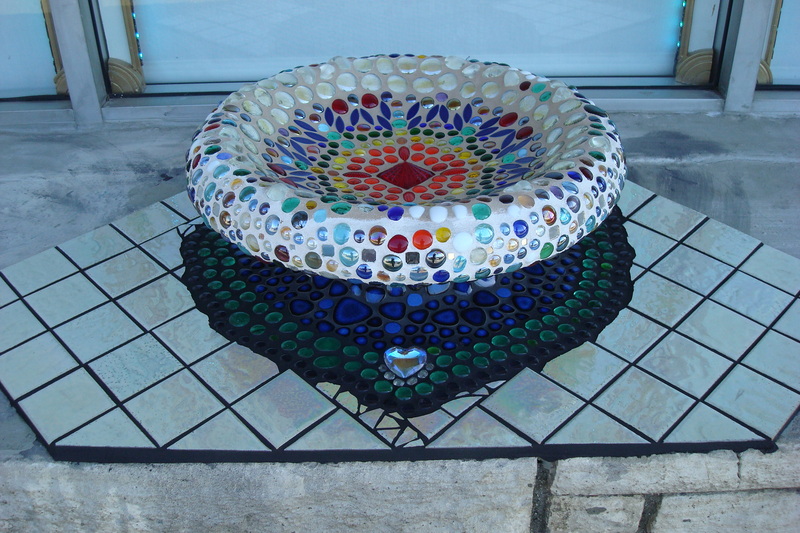 I love the fanciful way that she created jagged edges around the base of the birdbath and filled in any odd spaces with irregular pieces of tile. 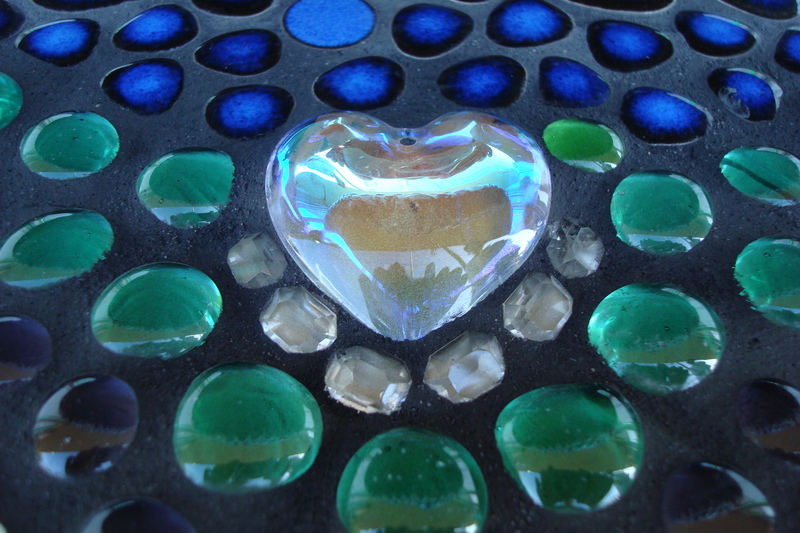 Inset amongst this array is a large clear crystal heart flanked by matching faceted stones. This is a special tribute to Marydale and the studio, since “love” is the first part of our mission statement to Love • Serve • Meditate • Realize. 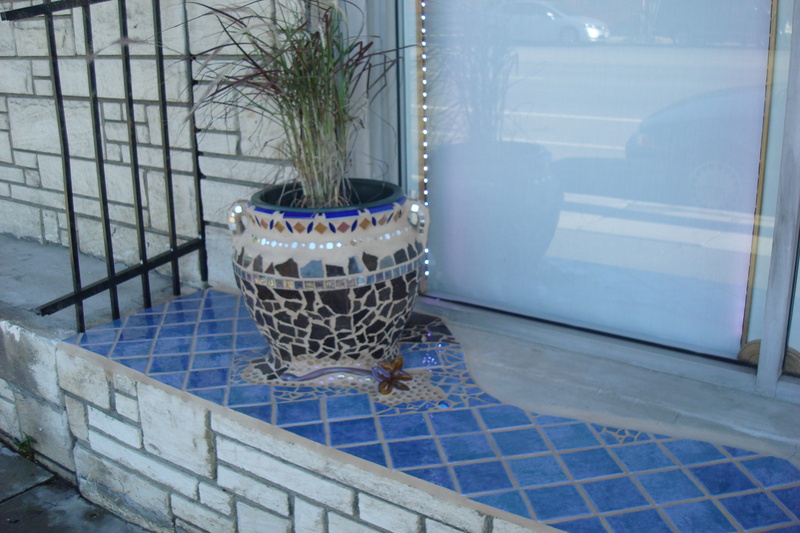 Before the heat wave hit us, Lisbeth was able to do more work on the urn, surrounding it with blue tiles that look like a twilit sky rendered in watercolors. She installed a temporary iron gate to separate our ledge from that of our neighbor and filled the urn with a native grass plant that brings the whole thing to life. When I think of mosaic, I always picture a flat surface covered with broken tiles. 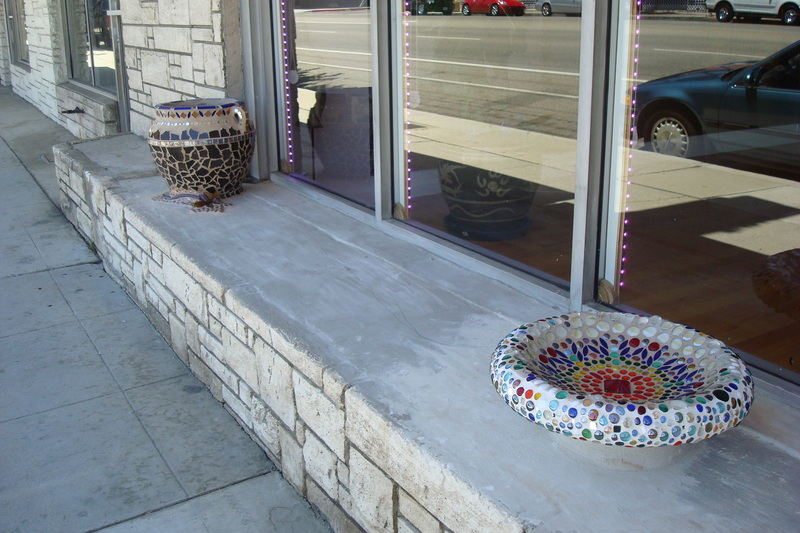 As a result, on the first day that Lisbeth began work on the front of our studio, I was surprised to see that she’d brought three large items to cement to the ledge. I hadn’t thought of the project as being so three-dimensional. 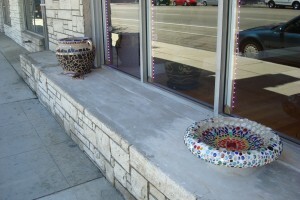 By far, the largest piece was the terracotta urn, which she installed on the left side of the ledge. 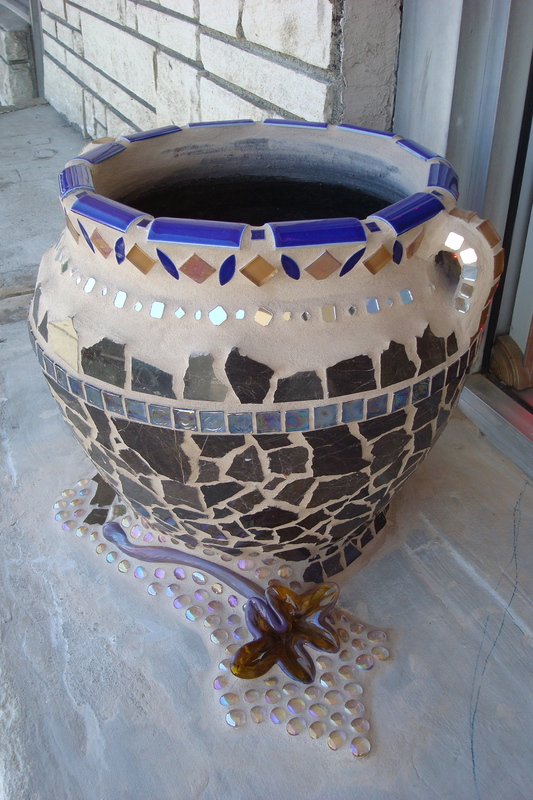 She intended to put a plant in it, which I thought was a wonderful idea, but I didn’t know at the time that the urn would also get the mosaic treatment along with everything else. 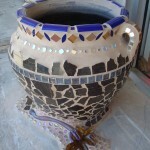 I love the look of plain terracotta, but Lisbeth changed my mind about the urn when she began to cover the rim with azure blue tiles and the sides with jagged pieces of a marbled black tile. Fun extras include iridescent glass squares and tiny pieces of mirror that cause bright spots of reflected light to dance over the studio shades as the sun moves across the sky during the day. She placed the second glass flower at the base of the urn, creating a symmetry with the flower at the base of the black rock on the right side of the ledge. 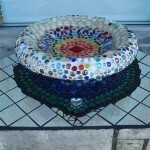 Now that the black rock, birdbath, and urn have all been decorated with Lisbeth’s signature touch, people in the neighborhood are beginning to take notice. Businesses along the West End of Devonshire have started talking about ways that they can beautify their own storefronts. 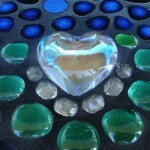 We may be at the beginning of an artistic revolution in Chatsworth!